While exploring vulnerability and authenticity, Blaine takes the audience into moments from the last two specials and things they haven’t seen- let alone could’ve expected. The thousands of people that filed into the Sands Bethlehem Events Center outside of Allentown, Pennsylvania, were greeted by Blaine’s split spade on massive LED screens, which did come in handy in projecting smaller moments to all of the audience members. But this was not a close up or “street magic” show projected to the theater. Along with this signature insignia came a warning not to take photographs or film. Similar announcements were made at Derek DelGaudio’s In and Of Itself and Derren Brown’s Secret in NYC. Blaine blurs the line between magic and something strange and less easily defined. His show is not the stunts, the show is not the tricks, the show is named “David Blaine Live” aptly. Within each moment of the show is an opportunity for the fans who have only known Blaine through the television to feel as though they met him. He’s all at once charming and witty while obscure and silent. He knows tension and release and takes the audience through the many bouts. 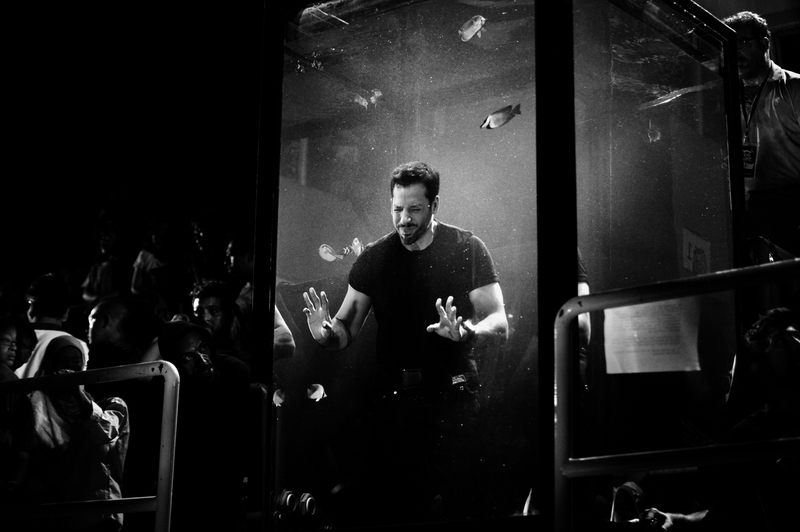 To see “David Blaine Live” is to see Blaine in what may be any other day of the week. The love for the show and performing he feels manifests itself through the momentary relationships he builds with those who join him onstage. In Bethlehem, no one from the crowd who was there will ever forget a man named “Hank.” Those who do join him are not spectators. Blaine might be best understood and his relationship to others. It is hard to meet someone so fully in their own solitude. The spectators were not used as tables or answering devices for memorizing cards but full-fledged human beings in which Blaine seemingly had genuine interactions with. At least a handful of people are indirectly asked to conquer fear or disgust every night, which Blaine asks them to do so sincerely and with gratitude. What separates him from the pack is an authenticity rarely seen in magic and rarely seen in live performance. One of the lay people I spoke to before the show shared that “He has none of the bells and whistles. No offense to Criss Angel or David Copperfield. Blaine is right in your face, right there. Here there are no smoke screens.” While the theater was filled with haze there really was no smoke screen. 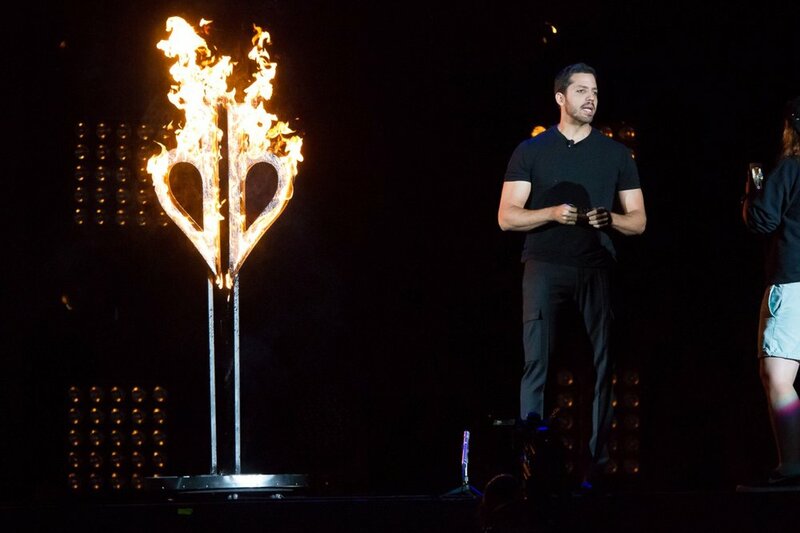 The David Blaine seen onstage matched the one the fans grew to admire on television and is the same Blaine as those lucky enough to catch some of his close up magic before or after the show. David Blaine experiments with his regurgitation by borrowing objects the audience needs to take back. Though the audience was diverse in this former steel town (the theater was literally in the shadow of the old steel mill) they united during the human aquarium. They were united in moments in which Blaine created tension and the entire room shared the same moment of cringing, sighing, or laughing. Large groups of the audience watched between the fingers of their hands with their palms on their face and children of all ages joined. At one point Blaine asks how many magicians there are in the audience and hundreds of hands went up. The magicians turned out for Blaine, whether it was out of curiosity or support, they were there. While the show followed the general format of a magic show the ending transcends that completely and couldn’t be accomplished by most performers and their fans. While the audience may feel inspired after his finale they are truly left with more questions than answers after “meeting” the man. But Blaine isn’t the only magician they experience. Asi Wind’s performance along side of Blaine allows the audience to see David beyond the title of magician. Since they see two different magicians with different personalities the audience experiences Blaine and his take on magic more thoroughly. Even in the show when Blaine hints to some of the complexities that come with performing the human aquarium as he calls it, the mystery only grows. The information is only additional to all of the thoughts flying around in the head of the audience. It only opens doors- it doesn’t close them. Theatrically, David Blaine is really akin to Ricky Jay. While some may see their styles as vastly different they are both celebrating performers of the past. The performances take different avenues because there are two such different people but the content and always very similar. Jay’s performance is academic while Blaine’s is entirely visceral. In Blaine’s production the historical elements of the show are presented first hand and not as homages or vignettes to the past. How he possibly perform the regurgitation, breath hold, ice pick, water spouting, and card magic night after night may be the most impossible part of the show.